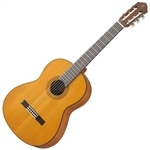 The CGS102A Classical Guitar is a great 1/2 size instrument for students learning to play. The Yamaha guitar features a spruce top, meranti back and sides, a nato neck, and a rosewood bridge and fingerboard. The Yamaha CGS103A 3/4-Size Classical Guitar is a great instrument for students learning to play. The guitar features a spruce top, meranti back and sides, a nato neck, and a rosewood bridge and fingerboard. The CG Series classic guitars provide quality materials and craftsmanship in a variety of price points. These instruments deliver excellent tonal balance with their improved woods, finishes, and thinner necks for extended comfort and playability. The C40A Nylon-String Classical Guitar is an excellent choice for your first venture into guitar-playing; with high quality woods for the top, back and sides, a rosewood fingerboard and a sturdy Nato wood neck. Also known as Eastern Mahogany, Nato is used in beginner instruments because it's inexpensive yet strong and reliable. The CG series classical guitars from Yamaha, provide quality craftsmanship, and offer the features of more expensive models in a variety of price points. These instruments deliver excellent tonal balance with their improved woods, finishes, and thinner necks for extended comfort and playability. The Yamaha CG122MCH classical guitar features a solid cedar top, nato back and sides, and a rosewood fretboard with a natural matte finish. Now with lower string action for increased playability, the CG122MCH draws on the vast knowledge and techniques of Yamaha's master luthiers. Yamaha classical guitar craftsmen learned the fine art of guitar making directly from the masters. Under the tutelage of Manuel Hernandez and Eduardo Ferrer, Yamaha guitar craftsmen acquired skills that have been handed down from master to apprentice for generations. These acquired skills are put to use every day in the making of Yamaha classical guitars. Through extensive analysis, research and experimentation, Yamaha has succeeded in blending the best and most critical aspects of traditional Spanish guitar making techniques with modern guitar manufacturing processes. These processes include a comprehensive quality check system that ensures each instrument is of the highest standards possible. As a result, Yamaha brings to you an instrument that delivers outstanding quality and performance, at a price that is hard to beat. Inspired by traditional classical guitar design, the SLG200N features a slim neck, thin body and low action that lets players adopt a more aggressive style, allowing even those players who wouldn't normally choose to perform with a classical guitar to play it with ease. SRT Powered is a new system designed to recreate the body resonance of an acoustic guitar in a bodiless guitar. Yamaha developed SRT Powered, collaborating with recording artists to create a system tailored to the unique properties of the new SLG body and modelled after the tones of a high-end Yamaha acoustic guitar captured using a carefully selected microphone in a professional recording studio environment. By actually reproducing the sound of an acoustic guitar-right down to its natural sustain and decay-Yamaha lets guitarists experience the genuine body resonance, body tone and ambience of an acoustic guitar. The slim body of the SLG gives these instruments superb playability and allows players to switch to playing an electric guitar without any discomfort should the need arise. With the SLG, Yamaha set out to bring a modern feel to the classic contours of a conventional guitar. The distinctive design that emerged is the result of a collaborative effort between the project team and the Yamaha Design Laboratory and combines traditional guitar lines with an innovative new form unlike that of any guitar before it. The bodiless design of the SLG offers a natural, quiet sound that allows guitarists to play without disturbing others, whether practicing late at night or playing in the living room when the family is home. The SLG200N is nighty percent quieter than a conventional classical guitar. Connect to an external music player to enjoy music playback, enhance your playing with a range of authentic effects or plug in headphones to enjoy playing in privacy-the SLG offers a variety of functions that make playing even more enjoyable. What's more, SLG come with a built-in precision chromatic tuner, compatibility with both battery- and AC power and a range of other user-friendly features.